Inside each tooth is the pulp, which provides nutrients and nerves to the tooth. It pulp runs like a thread down through the root (root canal). When the pulp is diseased or injured, the pulp tissue dies. If you don’t remove it, your tooth gets infected and you could lose it. Years ago, if you had a tooth with a diseased nerve, you’d probably lose that tooth. Today, with root canal therapy, there’s a good chance the tooth can be saved. When you come to us with a sensitive tooth or even a full-blown toothache, the first step is diagnosis. Our doctors want to be certain about a diagnosis before embarking on treatment. 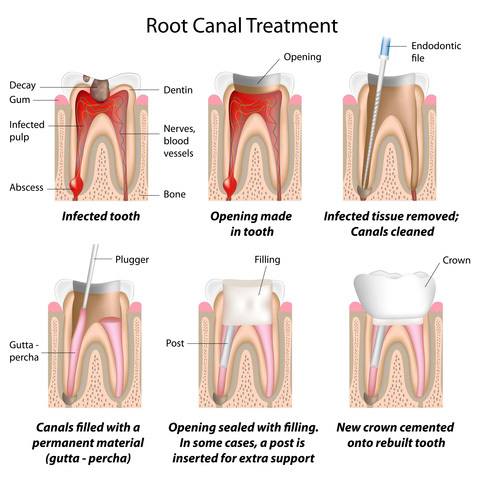 Often if root canal therapy is needed we do it here at Mission Viejo Dental Group. As General Dentists, we also know when to refer a root canal out to an endodontist, and we work closely with several trusted colleagues who are specialists in root canal therapy. Whether your root canal is done here or at a specialist’s office, the pulp is removed and the root canal is cleaned and sealed off to protect it. Then the tooth usually needs a buildup and crown to strengthen and restore it. Once that’s done, your tooth looks and feels as good as new. Don’t hesitate to call us if you think you may need a root canal. The most painful thing about a root canal is the toothache you have if you postpone dealing with it.